The official book trailer for Sandcastle and Other Stories is ready to unveil. 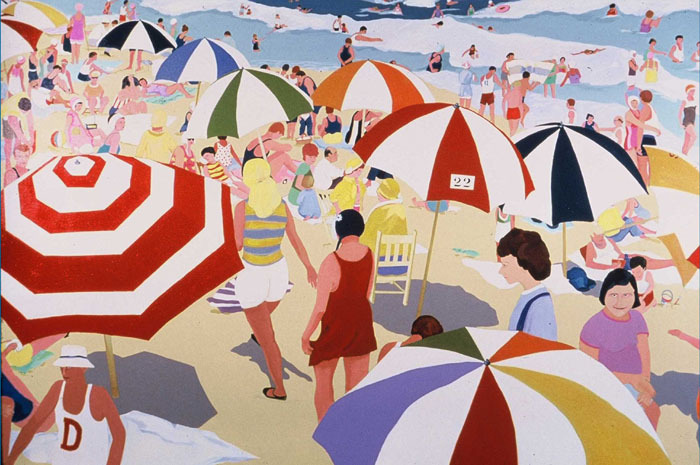 My father painted this New Jersey beach scene as part of his Boardwalk series, actually set in the 1930s. In many of the figurative work he loved to insert a family member. In this painting, my mother is there in the bottom righthand corner in the purple shirt staring right into the imaginary camera. I never noticed the little child behind her, but the woman — sorry Mom — could be Brenda from the title story, Sandcastle, and the child behind her could be little Jane trying to not block her mother’s sun. Please let me know what you think of my first foray into the book trailer world by leaving a comment. 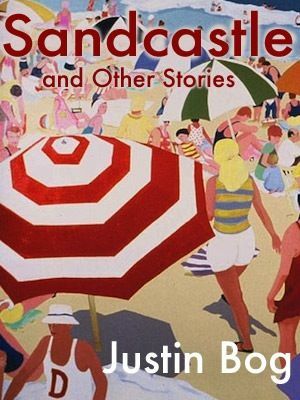 Ten literary, psychological, and suspense tales collected in Sandcastle and Other Stories are nothing short of an adventure through a roiling sea of emotion. An old man twisted by fate and a lost love . . . a young girl playing on the ocean shore becomes entangled in nets of a mercurial god . . . a divorced man mired in troubles, coerced into taking a singles’ cruise . . . a Hollywood actor in a television drama, always typecast as the bad boy . . . a child kept awake by night terrors, and a woman who hides her secretive personality from everyone on the beach one sunny day. Genuine voices of the characters, mixed with a clear-eyed tonal directness, make this a series with mesmerizing psychological interaction. Stories span a broad depth of human understanding and build a bridge between deepest chasms of pain and high portals of joy. Read Sandcastles and Other Stories and stand witness to unspeakable hate sitting with cozy wile, right beside unconditional love — a provocative and compelling mirror on the human condition. — Diane “Dee” Solberg created this initial summary book blurb, and it will appear on the back cover of the print version of the collection. Taken from her early beta review’s first paragraph, look for Dee’s full-length recommendation to appear at In Classic Style upon the book’s publication. The quotes from the book trailer come from a variety of people who commented when the stories were first published on my blog over the last year. You are one of the first to see how Convenient Integration put the pieces together for this book trailer — using motion, surf sounds, and quotes from readers of the stories — and created this compelling short film. If you would like to see more paintings my father painted during his lifetime, and more coming too, please hit the underlined link here: www.bogdanovitch.com. Please subscribe to A Writer’s Life blog and Follow me on Twitter @JustinBog. For the latest in Travel, Leisure, and Entertainment, check out the e-Magazine In Classic Style. For any Apple/Mac IT support or WordPress design/implementation/hosting/Multimedia Publishing, please contact the business I use: www.convenientintegration.com. OMG! Justin! That book trailer was Awesome!!! Fabulous trailer, Justin! Well done you. Loved it. Have shared and will continue to do so. That’s the best news to wake up to, Jane. Thank you very much. I wanted the trailer to have a sense of looming suspense. The book trailer looks fantastic! Heather, I’m always saying to you that YouRock because you are awesome. Thank you for watching the trailer. Your opinion means a lot to me. Justin, love it. The quiet calm of the ocean interspersed with the scary, catchy phrases is extremely intriguing, and then of course, there’s the fabulous painting from your dad. Woo hoo, eden. The journey of one little book to ePublication is happening. and I thank you for letting me know the trailer left you intrigued. Thank you thank you thank you. I’m sooooo excited for you. You’re welcome you’re welcome you’re welcome. Give my best to Chris for the very good job!!! Very relieved ~whew~ — I was wondering if you’d like it Staury since there’s not a Kipling or Zippy photo in the video (not my fault — I pushed for a couple dozen, but Chris stuck to his plan LOL) . . . next book I write is going to be about German shepherd trainers. Thank you very much. I already told Chris and he smiled towards Cyprus. The unspoken line between unconditional love and the intense manifestations of familial conflict is one in which authors have shied away from for far too long. I think it’s because we all don’t want to twang that taut cord in fear of shattering our illusions. Bravo Justin. Bravo! Hey Justin, this is good news! And such a cool painting, too. Congrats, and I’ll be watching for your launch. It’s going to happen, unless those Mayans were right, but I’m not going to worry about that much. Three weeks or less 🙂 Thank you Laura, and you’ll hear me ringing a big book bell on the top of a Himalayan peak like in that 2012 flick of a couple years ago. So great, Tonya . . . but, no, I don’t have time to do my own yet made the time . . . got the chains and didn’t leave my desk LOL But I like having it as a companion to the book, definitely. I wrote in a separate place that I can see your book with a really cool visual style, taking the characters from your A to Z posts and lining them up like mugshots with the character names below each photo . . . that stays in my mind. Best of luck to you always. OMG! OMG! OMG! This is so cool, Justin! Well done! Now you know what I’ve been up to for the past two weeks (less time to socialize, that’s for sure) . . . but I have your Kipling and Zippy Dolls right next to my desk and think of you each time I see them. With great fondness . . .
It’s nice to have the book trailer to point someone to. I volunteer to be in your next trailer, Charity, if you need a middle-aged Shleprock (probably not though ~hangs head in anticipation of answer~) . . . This trailer is amazing. You are such a beautiful creative, Justin. cannot wait to help you promo your book! Your comment thrills my artistic mind, Amberr, more than you will ever realize. I humbly thank you. You are one of the kindest, and most selflessly supportive friends I’ve met in my writing life. Cheers to you. Cathy, as always, I love your writing life passion. I hope to see your own books lining my shelves over the coming years. Thank you very much. Great trailer Justin. I’m looking forward to reading your book. I love the book trailer! And I’m very impressed with the changes to the blog! I 1+’d this post for you 🙂 I’m looking forward to seeing your book for sale on Amazon! Thanks for sharing! Barb, I am so tickled to read your comment. I am but a humble jedi apprentice, but after Star Wars Part VI, and not one of those sorry kids from Part III. Thank you very much. I loved the trailer. But am captivated by the painting of your Fathers and the sounds of the ocean. Looking forward to reading the book when it becomes available. HI JUSTIN, I WAS FINALLY ABLE TO VIEW YOUR TRAILER. LOTS OF WORK. SO VERY PLEASED FOR YOU.I ALSO LOVED THE PAINTING, LOOKING FOWARD TO YOUR BOOK. I can’t wait for you to read my book, Helle 🙂 Is next week soon enough? I admire the pr you are already doing. It’s funny, because I have a short story collection coming out in June, and you’ve given me some ideas about possibly doing a trailer. My only confusion about the trailer, at first, was whether or not the comments were quotes from people in the book. And then I realized it must be from people who’ve read the book and enjoyed it. With this in mind, I would’ve liked to see people’s names attached to the comments, even if the names were just initials. Well done other wise, and the blurb section is fantastic. How does one get in touch with “Dee”? It’s nice of you to comment here, Yamina. I like the way the trailer worked too. There was no room for the names on the trailer, but they are accredited at the front of my eBook as well. Besides, like in my stories, I like giving anyone an unsettled feeling: were these quotes from the book? Maybe. LOL I wrote a Tweet talking to you about Dee. She is very busy, but she only wrote her review after reading the complete book, and I don’t know what her schedule is except to say she’s planning a huge move very soon and is really swamped. Thank you very much for saying that, Kelley. Kipling and Zippy so wanted to be in the short video. This is the Coming Attraction trailer and there’s another trailer in the works now that the book is available at Amazon. A really different approach, but I like it.